MOISTURIZING CONDITIONER FOR THIN HAIR - Rinsing light conditioner that revitalizes the fragile thin hair and lifeless hair, providing full-bodied, strengthened and glow hair. Its fast absorption formula helps to repair and strengthen the hair, making the necessary hair absorption of moisturizing doesn´t induce excess conditioning or heaviness. 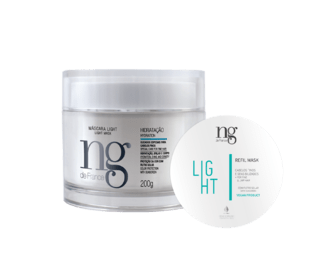 The NG de France, developed the complex organic compound Big Sure Complex, made by exclusive essential organic oils that get in the strands not leaving them oily or heavy. Stronger and full-bodied hair.